Todd has been involved with MWC since 1999 and as of March 2007 is its owner. Todd was born, raised, and currently lives on the North Shore. He graduated from UBC in 2002 and has traveled in Australia, S.E. Asia, and extensively in Europe. 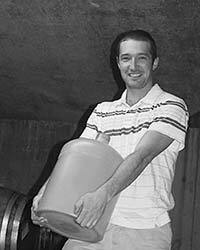 He worked in retail in the sporting goods industry for many years, in construction, and did his stint with the District of North Van before embarking on his career in the wine making business. Todd oversees the sales and marketing for MWC and is involved with production quality control.